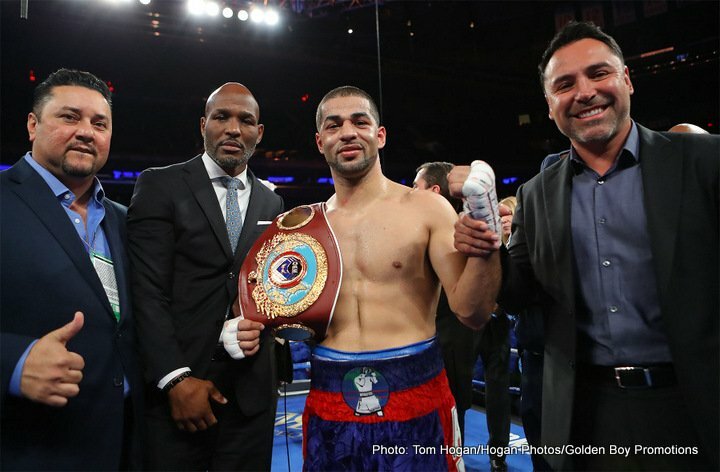 What next for new WBO 154 pound champ Sadam Ali? We all knew Sadam Ali could box, and last night’s win over an admittedly faded (but still great) Miguel Cotto put “World Kid” on the world stage once again. Ali, 26-1(14) has rebounded well from his March 2016 stoppage loss to Jessie Vargas, the 9th round TKO being the sole defeat on the record of the 29 year old. Ali rebounded to beat three solid fighters in Saul Corral, Jorge Silva and Johan Perez, and now he has the scalp of future Hall of Famer Cotto on his resume. What next for the new WBO super-welterweight champ? Ali has shown he is as fast as a 154 pounder and he was down at welterweight (where the loss to Vargas took place) and he has looked strong also. It would be great to see Ali in there with the other reigning 154 pound champions – Jermel Charlos, Erislandy Lara and Jarret Hurd. While from a UK perspective, it will be interesting to see if promoter Eddie Hearn has any ideas of matching Kell Brook – who is set to make his 154 pound debut next year some time – with Ali; either in Kell’s first or second fight at the new weight. Also, a Liam Smith-Ali fight would be a big deal over here if it could be made. Ali, a sound boxer with a fine amateur background, is a likeable person, he is willing to fight the best, he is pretty much at his peak now and he could be around to stay. The current 154 pound division is not the most exciting division today, but there is plenty of talent there – and Sadam Ali might just feel that he is now the top dog of the division. Unification fights are always good news and are very much welcomed by fans, and it would be good to see Ali get in there with one or more of his rival champions. Let’s see if these fights can be made next year. For now, Ali can both enjoy and savour that special feeling a fighter gets when he has defeated an all-time great. You are here: Home / Boxing News / What next for new WBO 154 pound champ Sadam Ali?